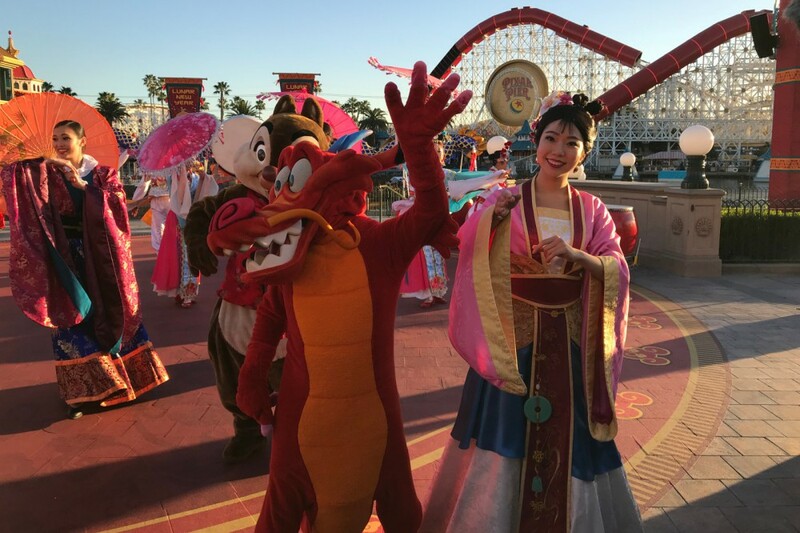 The annual Lunar New Year Celebration at Disney California Adventure kicked off this weekend, with food, entertainment, food, crafts, food, and characters. The culinary choices were expanded this year, with four booths, instead of the usual three, so there was even more food to try. Being the dedicated reporter that I am, I visited every booth and tried nearly every food item available by 1:00pm on opening day. Keep in mind that was a LOT of food shoved into a short period, and a full stomach may have clouded my judgment on some items. Be sure to visit The DIS for full menus and pricing for all of the food mentioned! 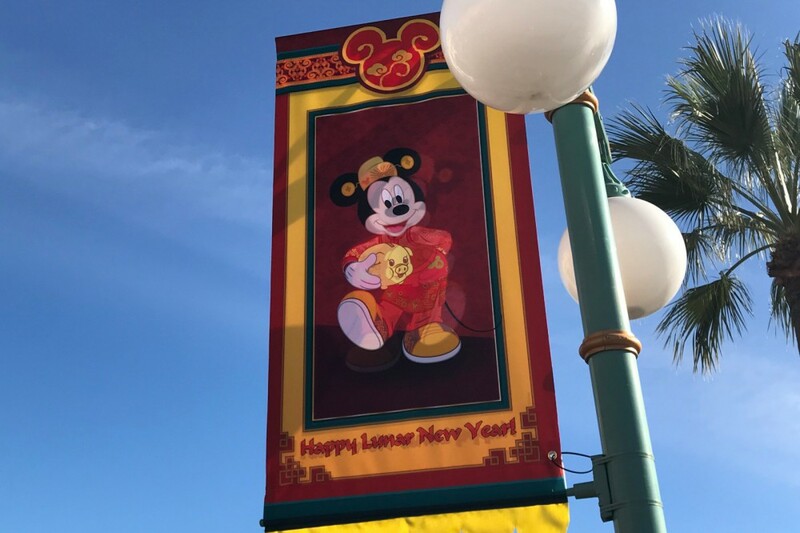 This year, the Sip & Savor lanyards that have been available at Festival of Holidays and Food & Wine were introduced at Lunar New Year. The souvenir lanyard was $39 (or $36 for annual passholders) and included 6 tastings. As always, do the math to make sure it’s a good value for you. The Sip & Savor booth was my first stop. Of course, that weren’t nearly enough tabs on there for what I planned on eating, so for some things I paid cash. Something else that’s new this year, is an attempt to make things a little easier for guests. At cash registers for any of the four booths, you can pay for items sold at the other three booths. You’ll get a receipt for the other items, then when you’re ready for that item, you just go up to the window to pick it up. No more waiting to pay in four different lines. It should be a great time saver on busy weekends. 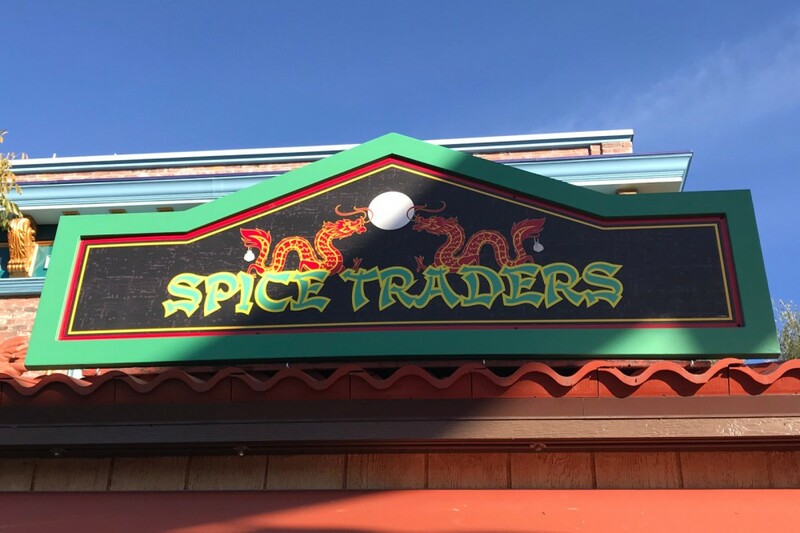 I started my culinary quest at the Red Dragon Spice Traders, which is located in front of Embarcadero Gifts and would be the first booth you come to when entering the area from the Pacific Wharf. As the name indicates, the savory dishes at this booth are meant to be spicy. 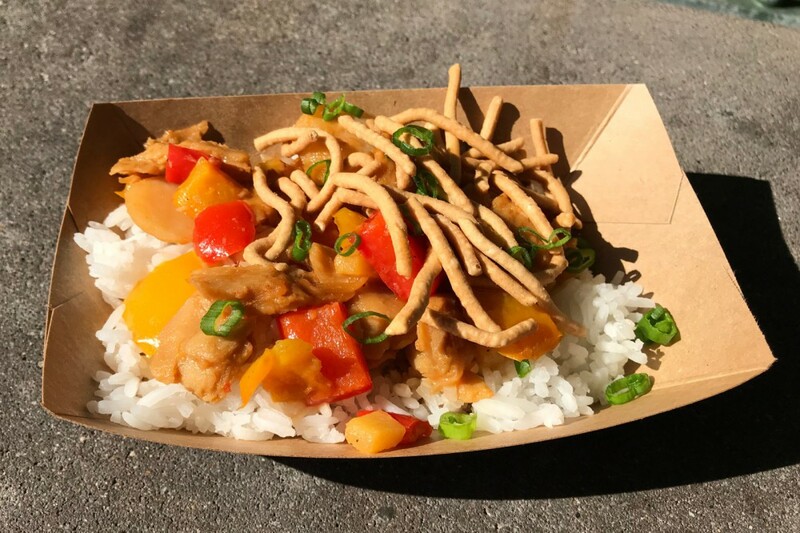 The Firecracker Three Cup Chicken with Steamed Rice [$7.25] is a returning item, with just a little added spice. It had the right amount of heat, but was missing something…maybe salt. I also thought that by serving it in the small bowl instead of a tray like most other items, it made the portion size seem small. I might give this item another shot. 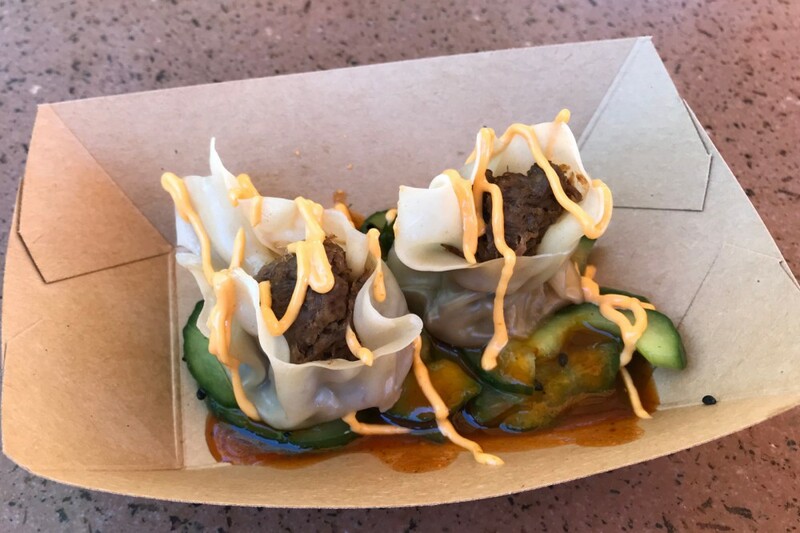 The Steamed Short Rib Shumai with Korean Sauce, Sriracha-Mayonnaise and Cucumber Salad [$7.75] was one of my least favorite dishes of the event. The dumplings were too big for one bite, but were too tough to cut with a fork. The dumplings also got cold after being served on top of the very cold cucumber salad. I’m usually a fan of short rib, but this was underseasoned and a disappointment at a $7.75 price tag. The Purple Yam Macaron [$5.50] is back, but this year is filled with creme fraiche. Don’t let the color or the vegetables throw you. 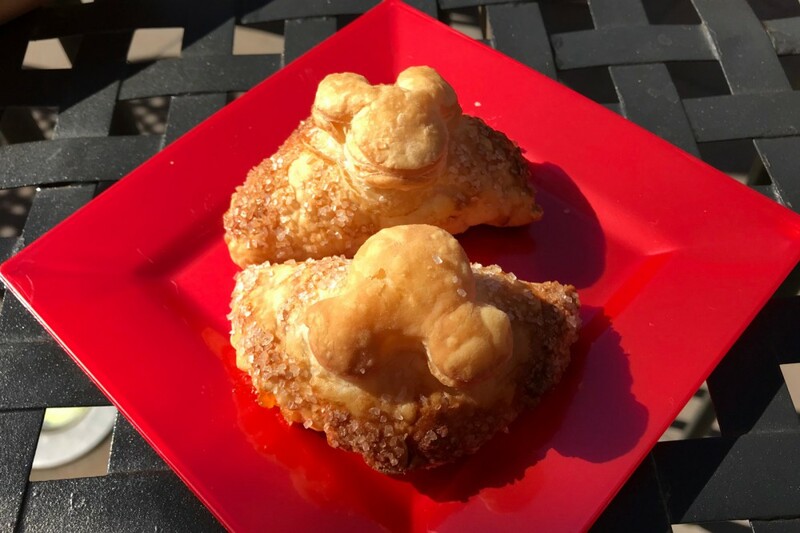 This is a great dessert, but may get too sweet after a few bites, so share it with a friend! 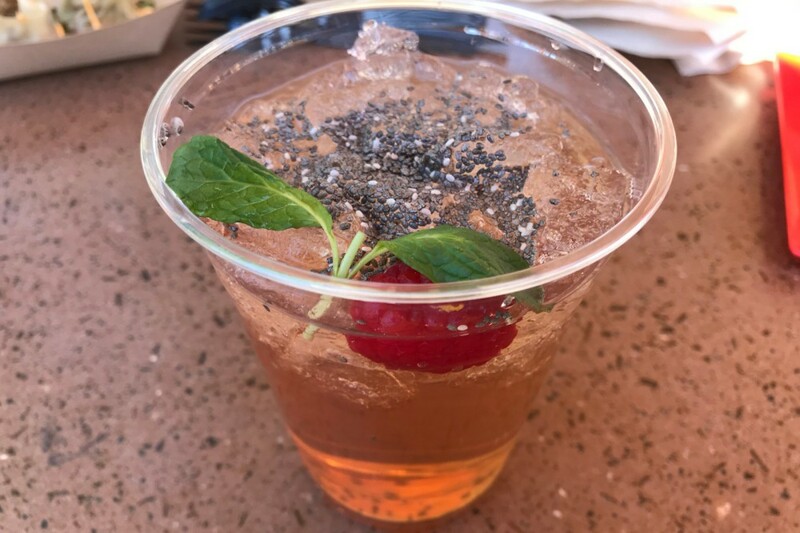 The Raspberry Lychee Chai Tea [$6.00] was a nice way to wash down the spice of the savory items. It wasn’t overly sweet and was very refreshing. 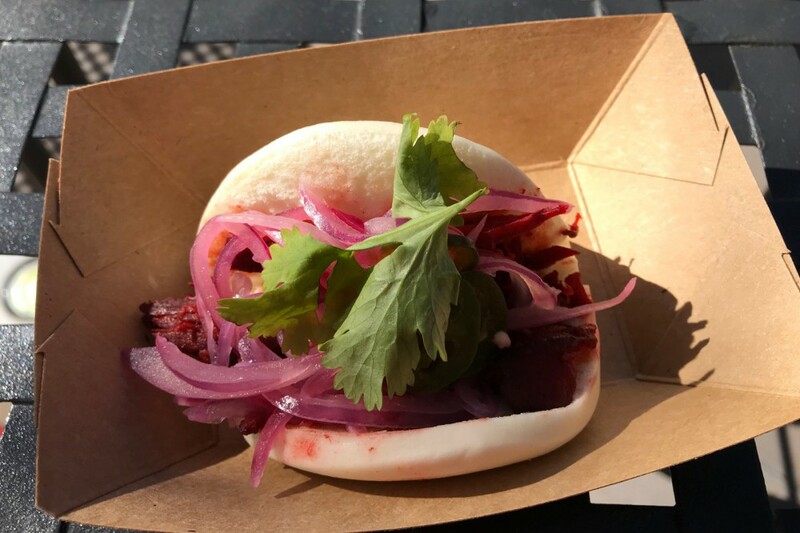 Next, I headed to Prosperity Bao & Buns, which is located in front of The Little Mermaid-Ariel’s Undersea Adventure. Again, I tried everything on the menu except for the alcoholic beverage. I found the Char Siu Pork Bao [$7.75] to be very dry…both the bao and the pork. The flavor was okay and the pickled red onions were good, but it didn’t make up for the dry pork. 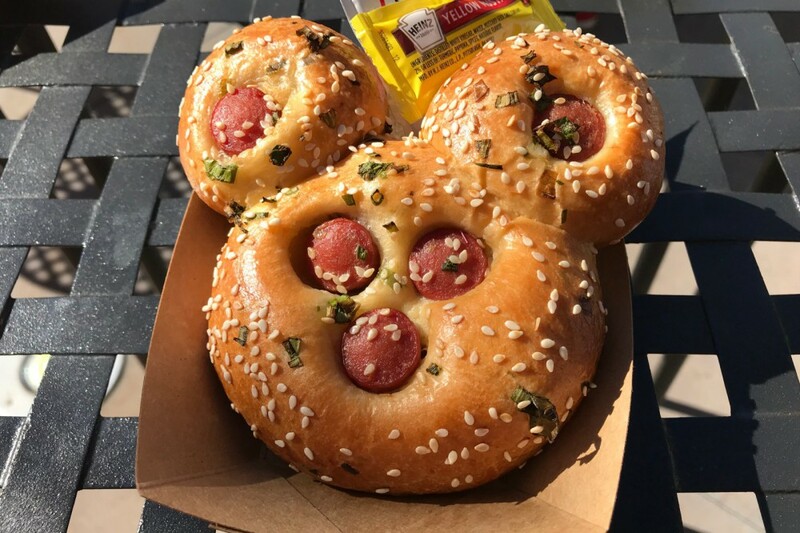 While it was interesting, I was underwhelmed by the Mickey Chinese Hot Dog Bun [$6.50]. This item might be great for kids, but at $6.50, I would expect more than five slices of hot dog. Maybe I’m not the target audience for this one. 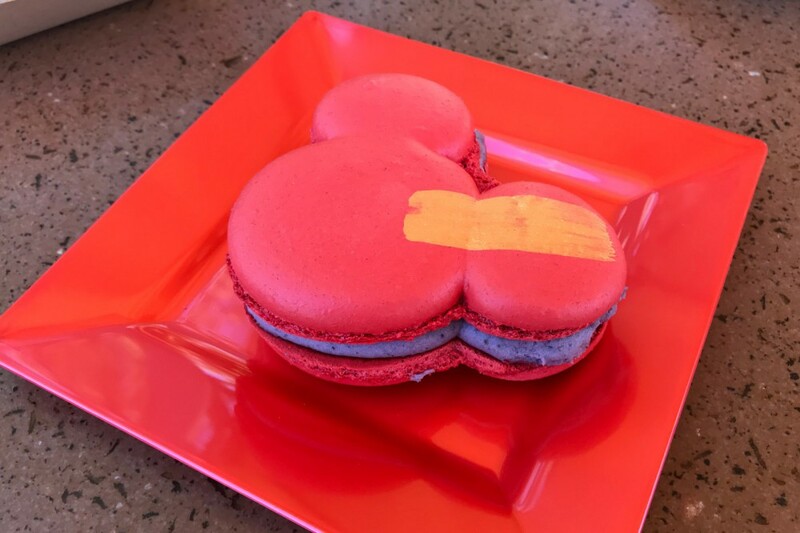 The Mango-Pineapple Pastry [$5.50], with its Hidden Mickey, was a tasty dessert and perfect to share with a friend (or the next table, which is what I did). So far, the desserts have been the highlights for me. The first of the two booths in front of the Golden Zephyr is the Lucky 8 Lantern, which concentrated on rice dishes. I picked up both savory items, plus the dessert, but skipped the Vietnamese Iced Coffee [$5.50]. 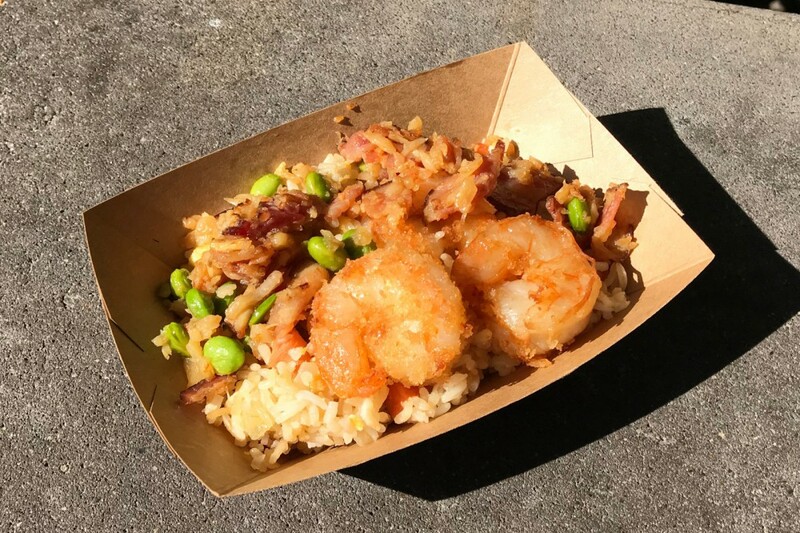 The Crispy Shrimp Fried Rice with Garlic, Bacon and Edamame [$8.00], which is the most expensive item at any of the booths was good, but not great. The rice with the bacon and edamame was tasty, but I would’ve loved the bacon to be crispier. The crispy shrimp could have used some more seasoning…and maybe one more shrimp. The Stir-fried Vegetables & Pineapple with Soy Protein [$7.00] with pseudo-chicken had good flavor, but just wasn’t something I would enjoy. I’m picky about texture, and the soy protein just didn’t do it for me. I also don’t enjoy the flavor of bell peppers, so this dish was way out of my comfort zone. 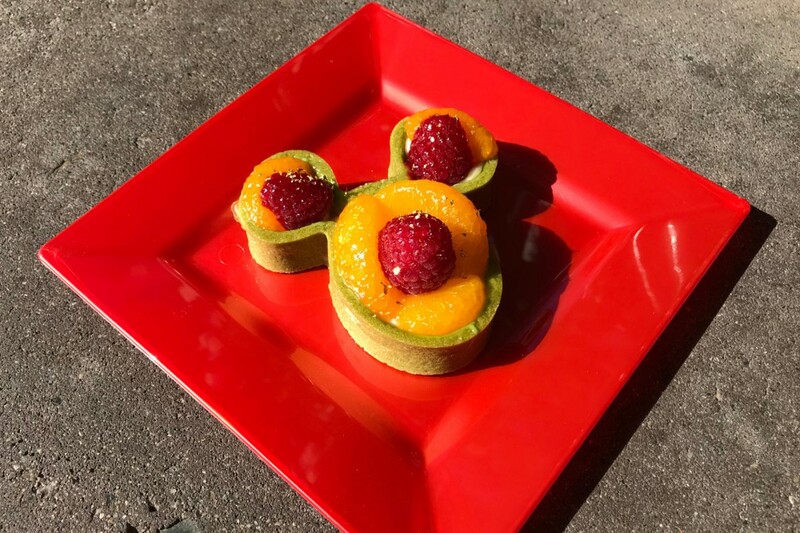 I talked about sharing the other two desserts, but the Mandarin Orange-Green Tea Tart [$5.50] is ALL MINE. This dessert with the fruit on top and custard underneath, was perfectly sweet and very refreshing. This was my favorite of all the desserts. My final stop was next door at the Longevity Noodle Co., which served two different noodle dishes. I picked up those, plus the dessert. I skipped the Orchid Spritz [$5.75] that is also on the menu because they were missing some of the items for it. 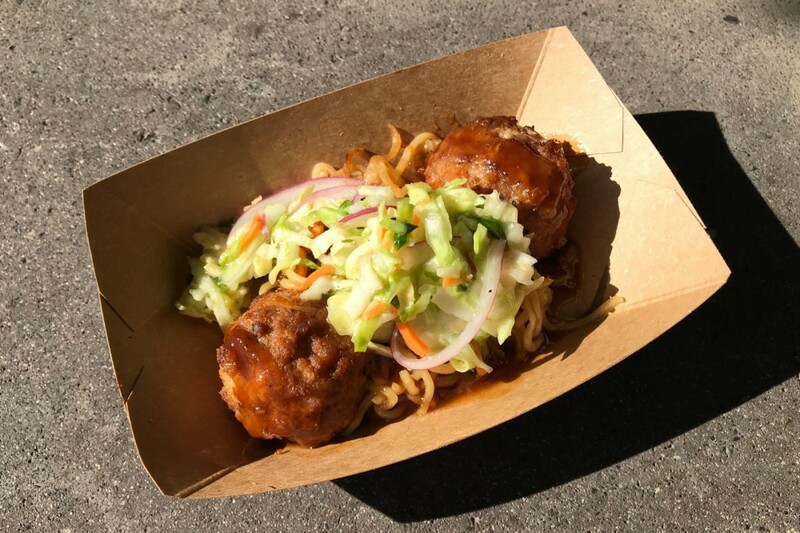 My biggest surprise of the day was the Pan-fried Wheat Noodles with Chicken Meatballs, Cabbage Salad with Apple-Ginger Sauce [$7.25]. I did not expect to like the chicken meatballs (again with the texture issues), but these were the star of this dish. They were perfectly seasoned, then browned on the outside, while still tender on the inside. Be sure to mix the slaw with the noodles for the perfect bite. I would go back for this item! 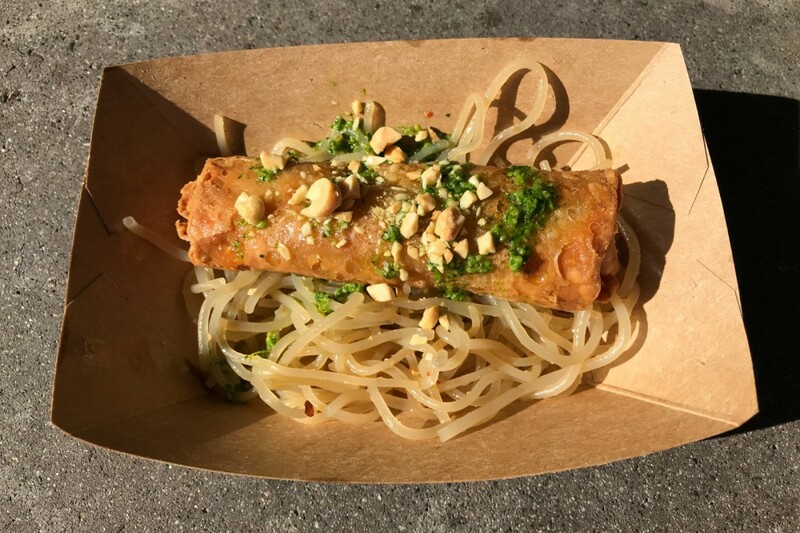 Pair that with one of the worst dishes in the Vegetable Egg Roll and Chilled Sesame-Garlic Noodles with Cilantro-Cashew Sauce and Toasted Peanuts [$7.00]. The cold noodles were undercooked and lacked ANY flavor. The egg roll itself had very little filling. I took a fairly large bite of mine and don’t think I got any vegetables. This dish has room to improve with better preparation, so I might give it another shot. 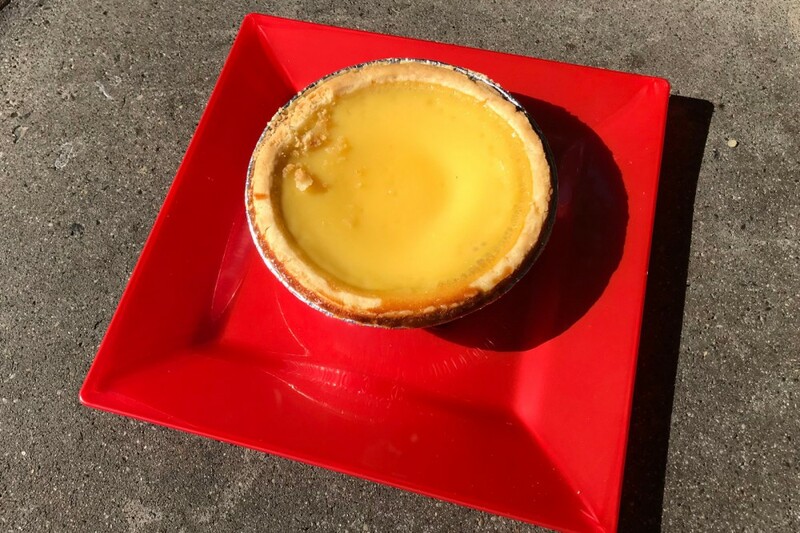 Finally another returning item, the Egg Tart [$4.75]. This simple custard pie is a great complement to all of the flavors going on elsewhere in the festival. It’s perfectly sweet and great to share with a friend. If I had to comment on anything, it would be that it would be nice if they took it out of the pie tin to make it easier to eat, but that’s really a minor detail. 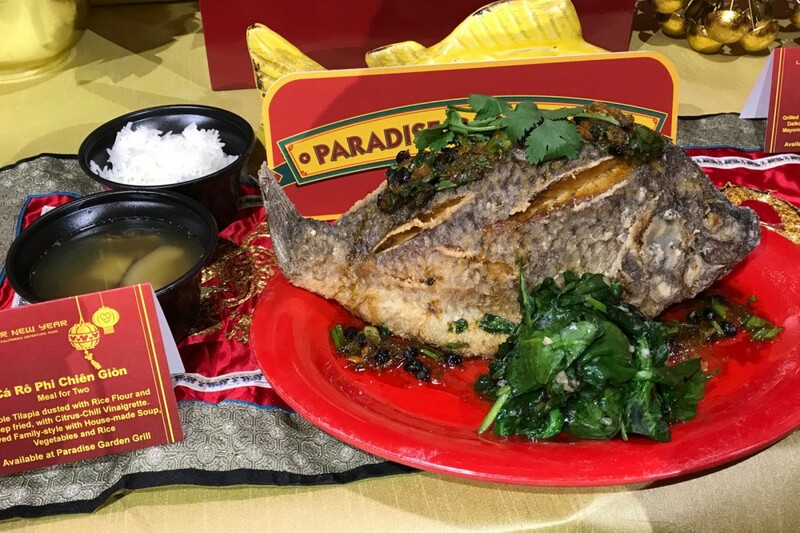 In addition to all of the small bites at the booths, Paradise Garden Grill is serving entree sized portions of several Asian favorites, include a Banh Mi and a Whole Crispy Tilapia served family style. 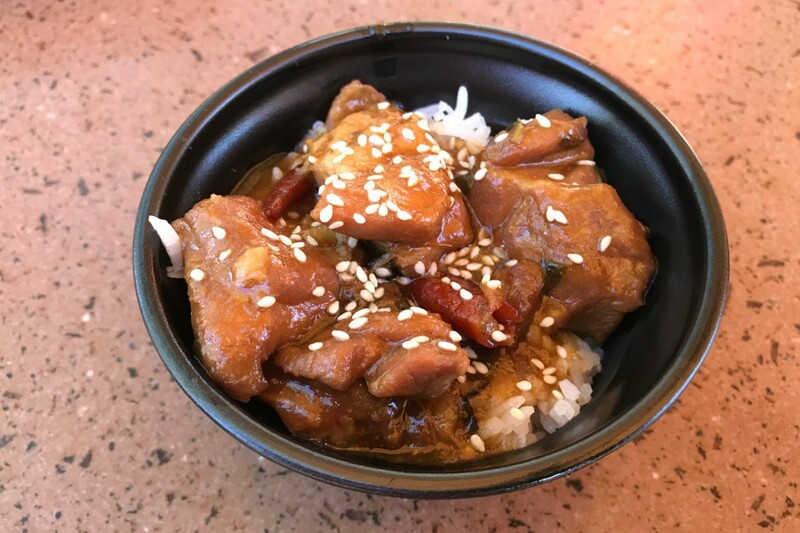 For guests that purchased the Sip & Savor card, smaller portions of some items are also available at Paradise Garden Grill that can be used with the card. Nearby, a Festival Food & Beverage Cart serves Gochujang Chicken Wings and Mini Almond Cookies! 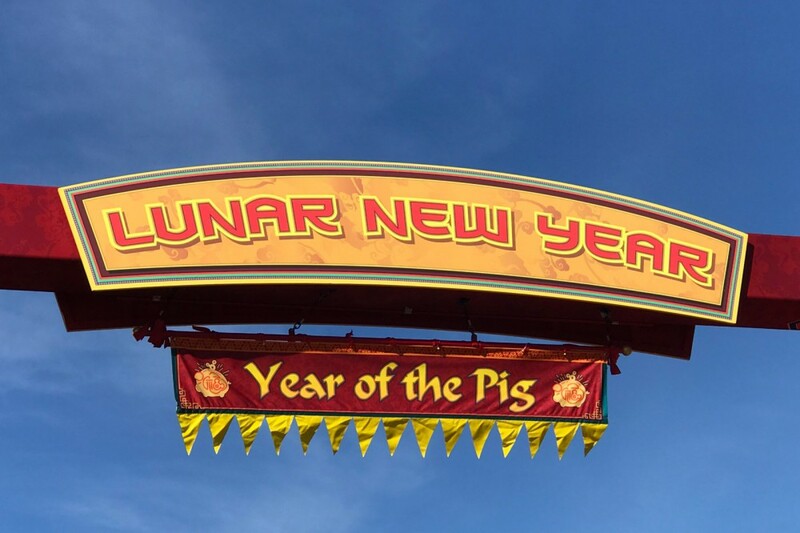 While I enjoyed everything in under two hours, the Lunar Year Celebration continues through February 17th, so there is plenty of time for you to sample everything! **Special note about our reviews: The DIS policy regarding reviews is that we only review experiences that we pay for. 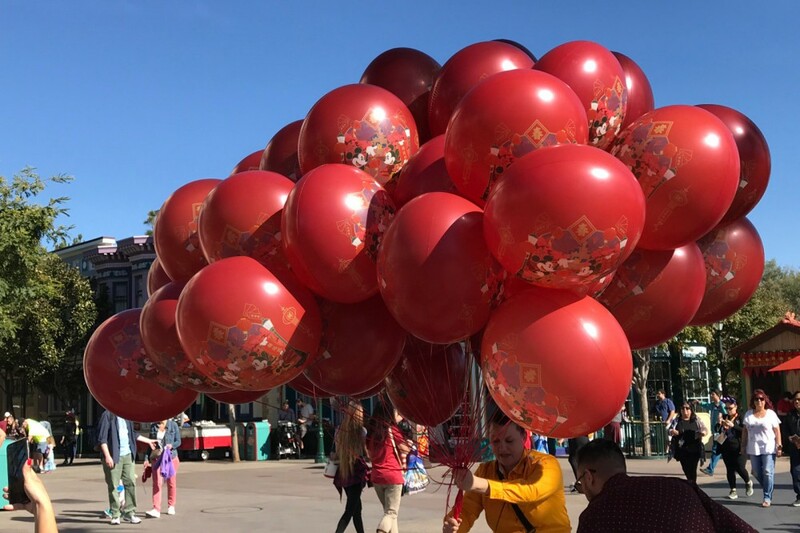 We may utilize annual pass discounts or other Disney-offered special discounts, but only if they are available to the general public. 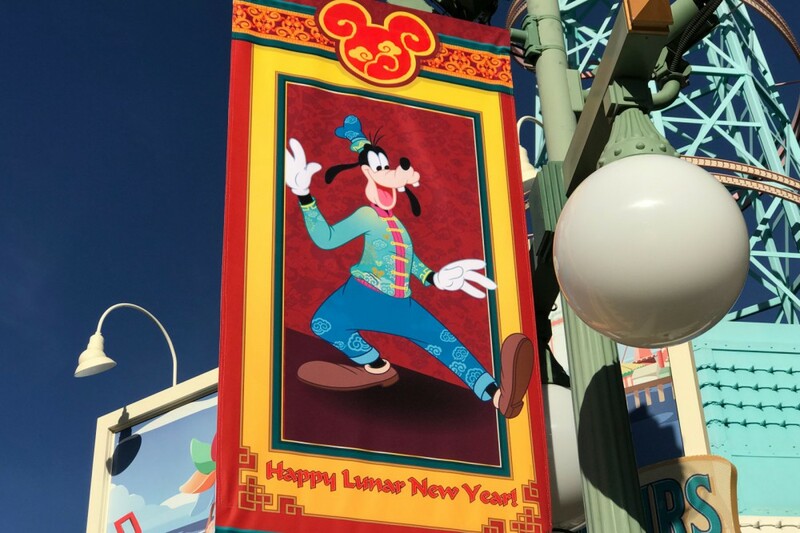 There was a media event associated with Lunar New Year, however, all of the items in this review were purchased and eaten BEFORE the media event began. During the media event, we received a free Sip & Savor lanyard, however, it went unused.